Operate a PC from up to 100m away, with uncompressed 1920x1200 DVI video and USB keyboard / mouse - The SV565UTPDUV USB DVI KVM Extender lets you control a PC from up to 330ft (100m) away over a single Cat 5e or Cat 6 cable connection, with uncompressed 1920x1200 DVI video and access to up to 3 connected USB devices. A flexible solution for powering large high-definition displays remotely, this DVI USB extender supports uncompressed 1920x1200 video resolution at maximum distance, with 24-bit color depth. 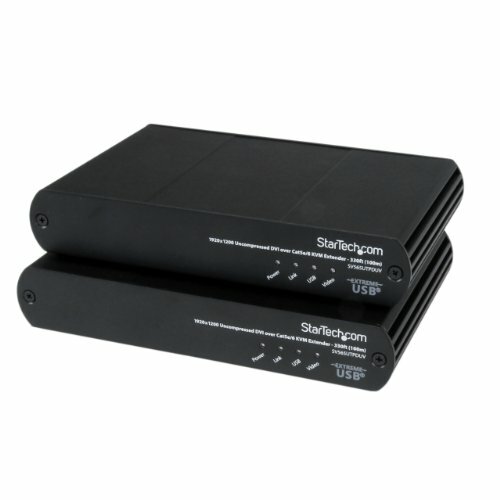 This versatile KVM console extender can be connected to a single system, or cascaded to an existing KVM switch for remote operation of multiple systems, and features 3 USB 2.0 ports on the remote end, allowing you to connect a keyboard, mouse, printer or other peripherals. Since the extender uses Cat 5e (or better) network cable, you have the option to use existing infrastructure wiring, which helps avoid the hassle and expense of running bulky video cables. Backed by a StarTech.com 2-year warranty and free lifetime technical support.